At Olympia Beauty CACI International will be showcasing their best-selling CACI Synergy system launched last year. 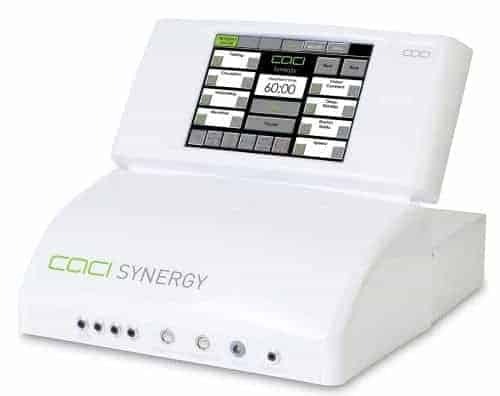 The new CACI Synergy features pioneering S.P.E.D™ dual action technology and is a breakthrough new advancement that delivers simultaneous LED skin rejuvenation and microcurrent facial toning. The multifunctional CACI Synergy has already generated significant press for delivering dramatic results without the need for surgical intervention. In addition get to watch live demonstrations of the cutting-edge CACI technology that includes the CACI Eye Revive salon treatment suitable for all skin types, soothes tired and puffy eyes, combats dark circles, reduces fine lines and wrinkles and lifts hooded eyes. The treatment uses serum filled CACI microcurrent eye rollers which have a cooling effect on skin to gently tighten and tone sagging muscles. The microcurrent eye rollers are infused with CACI Eye Revive serum which contain clinically effective ingredients to reduce puffiness by up to 31%* and dark circles up to 35%*. Visit the stand for the special show offer only available on the day.